Our Giant Hamster Balls are a unique and exciting way to experience the thrill of 360 degree fun. Whether standing up or sitting down, you'll have a blast rolling around on just about any surface. For even more fun, add a second hamster ball to create competitions. Big enough (and safe enough) for both kids and adults, it's like nothing you've ever experienced (unless you're a hamster)! Turn your next Hamster Ball event into a mind-blowing match-up. 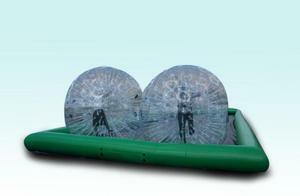 Experience 360 degree fun in a whole new way with our Hamster Ball Race Track! You can compete side by side in thrilling races or roll freely across our 75 foot long, 20 foot wide inflatable track. Suitable for any surface - from pavement to sand even on your own lawn!